It is hardly acknowledged by Christian scholarship that Buddhism potentially exercised considerable influence in the Western world as early as the third century BCE. In the middle of that century, Ashoka (r. 269-232 BCE)—the Mauryan “Emperor of Emperors” who conquered most of the Indian subcontinent—sent a Buddhist missionary contingent to Alexandria at the official request of the curious and enterprising emperor Ptolemy II of Egypt (r. 283-246 BCE)—the same emperor who founded the great Library of Alexandria (eventually destroyed, probably by Christians in 391 or 415 CE). What have I done? If this is victory, what then is defeat? If this is justice, what then is injustice? If this is gallantry, what then is cruelty? Is it valorous to kill innocent children and women? Did I do this to extend the empire and prosperity—or merely to destroy the other’s kingdom and splendor? Here someone has lost her husband, here someone a father, here someone a child, here someone an unborn infant… Aiiii! What have I to do with this endless debris of corpses? 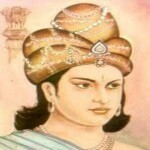 Ashoka became a devout Buddhist—the first pan-Indian emperor to convert to the religion. Thenceforth, he “conquered by the dharma” (Buddhist teachings) rather than by the sword—as he writes in one of his famous rock edicts scattered throughout his vast empire, which encompassed India, Pakistan, and Afghanistan. 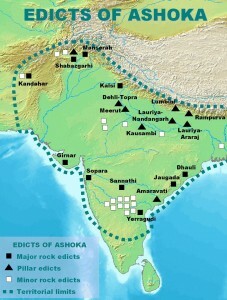 With the zeal of the true convert, Ashoka sent Buddhist missionaries far and wide. He built residences for Buddhist monks all over South and Central Asia, sent his only daughter Sanghamitra and son Mahindra to spread Buddhism to Sri Lanka (then known as Tamraparni), and sent many prominent Buddhist monks (bhikshus) all over the known world—including to the West. 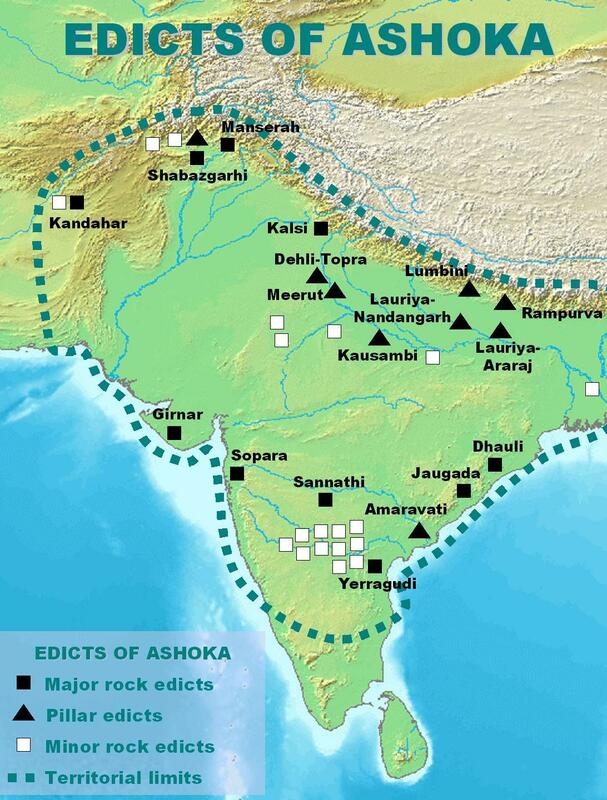 Now it is conquest by Dharma that Beloved-of-the-Gods [= Ashoka] considers to be the best conquest. And it (conquest by Dharma) has been won here, on the borders, even six hundred yojanas away, where the Greek king Antiochos rules, beyond there where the four kings named Ptolemy, Antigonos, Magas and Alexander rule, likewise in the south among the Cholas, the Pandyas, and as far as Tamraparni. 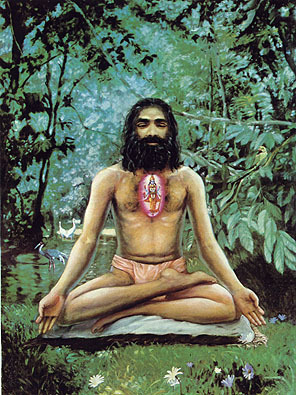 Here in the king’s domain among the Greeks, the Kambojas, the Nabhakas, the Nabhapamkits, the Bhojas, the Pitinikas, the Andhras and the Palidas, everywhere people are following Beloved-of-the-Gods’ instructions in Dharma. Even where Beloved-of-the-Gods’ envoys have not been, these people too, having heard of the practice of Dharma and the ordinances and instructions in Dharma given by Beloved-of-the-Gods, are following it and will continue to do so. This conquest has been won everywhere, and it gives great joy — the joy which only conquest by Dharma can give. Callimachus, (early 3rd century BC), the first bibliographer and developer of the first library catalog. Aristarchus of Samothrace (late 2nd century BC). Philadelphus is known to have sent an emissary to the Ashokan court, a certain Dionysus. In return, the emperor Ashoka returned a full complement of Buddhist monks to Alexandria, trained renunciants who had memorized the more important Buddhist sutras (discourses), together with palm-leaf copies of seminal Buddhist texts. One can only imagine the amazement of the dissolute Alexandrian court when the severe, bald-headed monks from India filed into the royal presence, aloof and dispassionate, clad in saffron-colored robes, bearing the precious manuscripts of the Buddha, manuscripts which they handed over to Philadelphus and which he then commanded to be immediately translated and enshrined with care in the Library of Alexandria. Regarding asceticism, Sir Flinders Petrie has written: “It was entirely foreign to the Western Ideals, yet it took root quickly after Ashoka’s mission.” (The Status of the Jews in Egypt, London, 1939:159). Indeed, Buddhism is the oldest monastic order in the world, and Christian monasticism is almost certainly a borrowing from the East. We have other examples of early borrowings from India. The Greek noun sindôn refers to “a fine Indian cloth, muslin” (Liddell-Scott), that is, to fabric imported from India (“Sind”. Cf. Isa 3:23, where sadinim means “fine linens”). The Greek word occurs six times in the New Testament, most interestingly at Mk 14:51-52, where the naked young man (neaniskos) flees from the Garden of Gethsemane leaving his sindôn—and Jesus—behind. Strabo (c. 62 BC – 21 AD) gives information of a flourishing trade between Egypt and India in the first century BC during the Roman rule. He himself accompanied one such trade trip down the Nile to Ethiopia, where goods were transferred overland to Myos Hormos on the Red Sea. About this time Alexandrian merchants used to send about 120 ships to India.”(Z. Thundy, Buddha and Christ, 221, 238). We have some indications that Buddhist monks were ensconced on the fringes of the Red Sea in BCE times. “Some archaeological evidence seems to support the view that a colony of Indians existed at Memphis as early as 200 BC” (Thundy 243). Certainly, Indians are found in Egypt in I CE, if we are to believe testimony attributed by Philostratus to Appolonius of Tyana (15?-100? CE), who allegedly visited them. In this series of posts we have investigated what I call “the Natsarene religion” (“Nazoreanism”), an aspect of Christian origins which is generally unknown—or ignored. The height of irony is that the true origins of Christianity have long been rejected by Christians themselves. It is as if a person rejects his own youth, or his ancestors… The result is that to be a Christian has little to do with Jesus and much to do with Paul, little to do with understanding and much to do with faith, little to do with our potential and much to do with God’s grace. So, the religion has moved far, far away from its roots which—as posts on this site show—were gnostic and world-denying. The first stage of Christianity, Nazoreanism existed before Jesus of Nazareth came on the scene. As late as the Gospel of Mark, the “Nazarene” was not a resident of the mythical settlement of Nazareth, but was a holy person, one who “kept [natsar] secret gnosis.” When we strip away the false Pauline overlay of Christianity—the kerygma or “proclamation”—we find a core teaching of some 150 sayings and parables which, I’ve suggested, delimit Nazoreanism and go back to a founding prophet. What this means is that everything ordinarily associated with Christianity is ‘late.’ Christianity has a pre-history. There were pre-Christians, and they were called in Semitic Natsraiia, in Greek Nazarenoi/Nazoraioi, in English Nazarenes. The Church made all these words derivative of the new settlement of “Nazareth” (Mt 2:23) and, in so doing, effected a sleight of hand. This was also a betrayal, for in so doing the Christian tradition turned it back on the gnostic religion which gave it birth. The emergent Church also turned its back on the founding prophet. It suppressed his biography and even his name, supplanting these with the far more commanding biographies which we read in the canonical gospels, and with the epithets “Jesus of Nazareth,” “Christ Jesus,” and “our lord and savior Jesus Christ.” The Christian scriptures themselves witness to the schism caused by this breaking away, as “Hellenists” separated from “Hebrews,” and as believers in (the newly invented) Jesus Christ separated from those who were quite aware that such a character never walked the face of this earth. I discuss the core body of logia here. When one examines that limited body of sayings, it soon becomes clear that it reflects a worldview in tension with Hellenism as well as with normative Judaism. It is foreign, and the ‘god’ it proclaims is a foreign god who has little to do with the world. At the same time, the core teachings possess extensive parallels with Buddhism, a philosophy which focuses on transcending the world. The view that Buddhism and Christianity share links (historical and/or doctrinal) has been known for some time yet viewed with a jaundiced eye in the West, and even held anathema in traditional circles. That is understandable, for such a view implies that Christianity is not unique but has a ‘relative.’ This in turn implies that Jesus Christ was not the unique Son of God… The researcher who views Buddhism and Christianity synoptically is persona non grata, for a global view undermines the entire Pauline keryma and Christianity as we know it. Nevertheless, significant links between Buddhism and Christianity have been well nigh obvious for a long time. Over the years, they have been documented in a number of scholarly books and articles more or less ignored by biblicists—as is the entire field of comparative religion. An extensive literature exists on the subject and I won’t treat that bibliography here, but refer the reader to signal works in the field, such as Albert Edmunds’ Buddhist and Christian Gospels (1914), Roy Amore’s Two Masters, One Message (1978), my own Buddhist and Christian Parallels: Compiled from the Earliest Scriptures (2004), and Marcus Borg’s less extensive Jesus and Buddha: The Parallel Sayings (2007).